"It's very easy to operate, is compact — small enough to set on a desk — and no other resources are required to operate the Horizon. We haven't had any problems at all." In recent years, 1.5-Tesla (T) systems have dominated MRI installations at centers that demand high-field technology. Today, 3.0T scanners with considerably enhanced imaging capabilities are poised to move into common clinical use. As a result of this transition, the need for dry imager technology capable of producing stunning images has never been greater. Perhaps no one understands that better than Thomas Chenevert, Ph.D., professor of radiology, MRI and Basic Radiological Sciences divisions, University of Michigan, Ann Arbor. To stay current with cutting-edge technology, the department acquired a Philips Medical Systems 3.0T Achieva MRI system in 2004. Bundled with the system was the Codonics Horizon multimedia medical imager. By marrying the high-end Achieva scanner with the Horizon imager, Philips underscored the two systems' perfect fit. Based on the results seen so far, Chenevert agrees. In fact, the University of Michigan, whose 40 radiologists complete an average of 400,000 patient examinations each year, hopes to add three more Horizon imagers by the end of 2005 — one for each MRI system in the department. 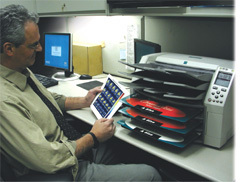 Prior to the bundled acquisition, the department utilized a variety of traditional film-only imagers to display MR images as hard copy. However, the growing importance of high quality color hard copy MR images — both to referring physicians and the medical record — has made this imager virtually indispensable to Chenevert and his associates. "We are becoming increasingly dependent upon the color representation of our MRI dataset," Chenevert said. "We rely not merely on the anatomical representation of a patient's scan, but on the functional information we derive from a scan as well. For display of quantitative images, color is a preferred format with which to represent complex information in an easy-to-digest visual fashion." Horizon quickly and cost-effectively produces diagnostic quality films as well as color and grayscale paper prints. Color prints are made of a photographic base stock with 16.7 million colors. Additionally, alternating between film and color printing requires no additional steps by the operator. "I use color to generate maps that represent either the fat content, the diffusion coefficient, the perfusion coefficient or the perfusion value in the tissues," Chenevert said. "I used our previous printers for the same purposes, but I now get a higher quality color print using the Horizon printer. It's a photo-like image as opposed to the color facsimile images that we acquired using our other systems." The radiology department currently uses the single Horizon imager while a second imager will be placed into service by mid year. Two additional imagers are expected to go online by the end of 2005. "The Horizon is very good for grayscale representation of the anatomy — for routine MRI, if you will," Chenevert said. "However, we think it's exceptionally good at representing more complex information." According to Chenevert, the dry imager can: effectively quantify fat levels in organs and tumors; enable spectroscopic overlays on grayscale anatomic images; facilitate functional MRI studies with the activation map overlaid onto grayscale anatomic images; and enable the creation of other quantitative maps, such as diffusion and perfusion images. Although used in conjunction with MRI, Horizon is compatible with the University of Michigan's various CT systems and 3-D workstations and can handle standard 14 x 17-inch film output. The unit connects directly with the 3.0T MRI scanner, enabling functional or spectroscopic maps to be inputted directly into the Horizon system from the scanner, an associated workstation or from a desktop computer. It is also ideal for specific clinical studies including brain imaging, abdominal scans and fat quantification in the liver. "When I want to place an image in a notebook, show it to a referring physician, or print out images for publications or some other use, I use the Horizon," Chenevert said. In addition to MRI, the imager is ideal for CT, CR/DR, nuclear medicine and PET studies, ultrasound and radiography/oncology procedures. "It's very easy to operate, is compact — small enough to set on a desk — and no other resources are required to operate the Horizon," Chenevert said. "And, we can put it anywhere in the department." It's also reliable, adding, "We haven't had any problems at all. "They're diagnostic quality, although we don't use the hard copy to diagnose — we use it as a record," Chenevert said. "We don't look at that record and say, 'Now, let's do the reading.' We'll make a hard copy, then say, 'Let's go show somebody.' "
According to Chenevert, hard copy images usually are shown during consults with physicians — often for inclusion in clinician records — and the variety of media formats and sizes provides a perfect solution. Chenevert noted, "We're using Horizon primarily for the color. The evolution of MRI is to provide not only exquisite anatomical information, but also functional information of normal and diseased tissues. For that we use quantitative images. Quantitative images are often conveniently displayed in a color format, which is often best presented in hard copy via an imager such as the Horizon." "The Horizon is meeting my expectations," he said. "Those expectations are high quality images as well as compatibility with a multitude of imaging inputs. I'm quite satisfied."